Runs for Cookies: Getting back outside! I don't bank with Chase, and knew there would be absolutely no reason for them to call me. I have a very old credit card with them, but there is no balance on it and I haven't used it in forever. 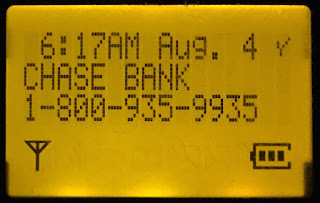 I answered the phone on the third ring, and there was that long, automated pause and then the line was disconnected. I immediately called the number back, to insist they remove me from their calling list. After going through all the automated stuff, and being transferred twice, I finally explained what happened. The customer service rep looked at my account and said nobody had called me, and nobody had called me from there in months/years. That makes no sense, because 1) it was on my caller ID, and 2) I called the number back that showed up on the ID and it was, in fact, Chase! For last week's speed work, I did 6.5 mph on the treadmill for three-minute intervals (that's about a 9:13/mile pace). Since I was running outside this morning, I knew my intervals wouldn't be as consistent in pace, but I was really curious about where my pace is at when running outside. I stuck close to my house, avoiding the routes where the birds are usually the worst, and pushed myself to what felt like a decent pace on my intervals. After a 90-second warm-up walk, I pressed the "lap" button on my watch to start my first interval. I ran for about a quarter mile, and then glanced down--I realized I'd actually paused my Garmin instead of starting the interval! I was super bummed, because I had just run pretty hard. But I started the new interval right away, and just started from there. 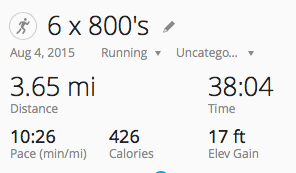 So my first interval was actually 0.75 miles, but my Garmin only shows 0.5. I really tried to run at a pace that I felt I could maintain for a 5K, but not much more than a 5K. Basically, it was hard, but not puke-when-I'm-finished hard. I was thrilled when I was done and saw my splits! I had been a little worried that the treadmill was playing tricks on me, but my pace is definitely improving. After showering and all that good stuff, the kids and I took Joey over to my brother's house to visit with his dogs. He was working, but Kendall (his girlfriend) was there. I can't remember if I mentioned this, but she moved in with him recently! Nathan had Bailey (a black lab) and Kendall had Tyke and Neela (two pit bulls), so they now have three dogs. Kendall is also dog-sitting her parents' poodle right now. And with Joey, that made FIVE dogs there to play! They all get along really well, and Nathan's yard is really big and fenced in, so the dogs had a blast wearing themselves out. When we were getting ready to leave, Eli kept telling me to there was a bee's nest on the porch. I assumed it was like any other I've seen, so I didn't pay much attention. But when we were walking out, I finally noticed it... and holy cow, it was HUGE. We had opened the door a few times, getting ready to go, and the bees (I think they were bees... they looked different from any I'd seen before) were all swarming all over the place. Once we got everyone back from the porch, and the bees calmed down, I took a quick picture. I've never seen a bee's nest that big before! Look at you, the travel baseball mom, already nervous about tryouts. :) I feel ya, sister! I hope he does great, but even if he doesn't, it'll be a good experience for him. I promise! Great job on the speed work!! I was about to say the same thing! Be careful! "Hansons calls for a 0.25-mile recovery between intervals, but I just shortened it to 90 seconds." -By not following the training program, aren't you worried that you'll reinsure yourself? I mean the programs are in place to try to prevent you from over training. Hansons is assuming a slow run for recovery. Since I'm walking for recovery, And not running, shortening it a little is fine. ahhhhh kill it with fiiiiiiire! 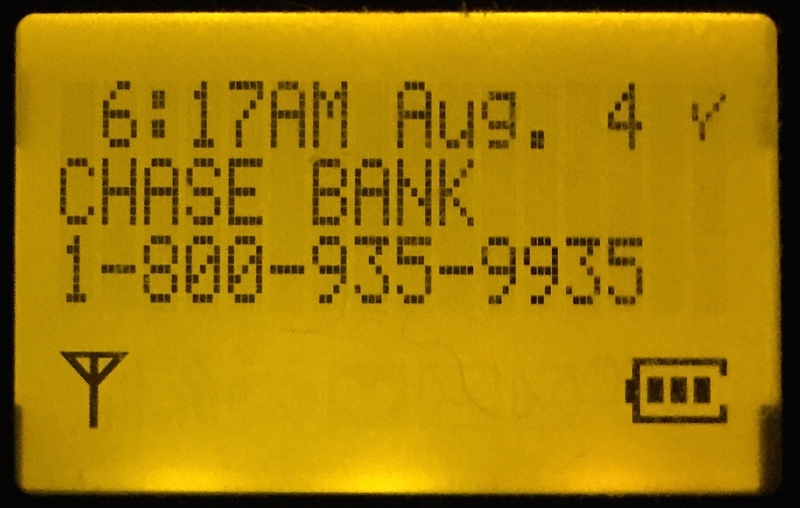 It's totally possible that the Chase call was actually a scammer who managed to mask their caller ID. It's called "spoofing" and it's a huge problem (esp. for elderly people). You can report it to your state's consumer protection bureau & see if they can open an investigation on it. Yep -it's spoofing. I used to work for Chase. Scammers can make any number come up on your caller ID. The often pick the number of a huge company, expecting many more people to have an account there and pick up the phone.